Sign in to your AdMob account and select ad technology providers. Add the line in bold above, which instructs Gradle to pull in the latest version of the Consent SDK. Once that's done, save the file and perform a Gradle sync. Prior to using any other methods in the Consent SDK, you should update consent status to make sure the Consent SDK has the latest information regarding the ad technology providers you've selected in the AdMob UI. If the list of ad technology providers has changed since the user last provided consent, the consent state is set back to an unknown state. One option is to use the Consent SDK to present a Google-rendered consent form to your users. The consent form displays a list of the ad technology providers you've selected in the AdMob UI. The Consent SDK stores the user consent response. 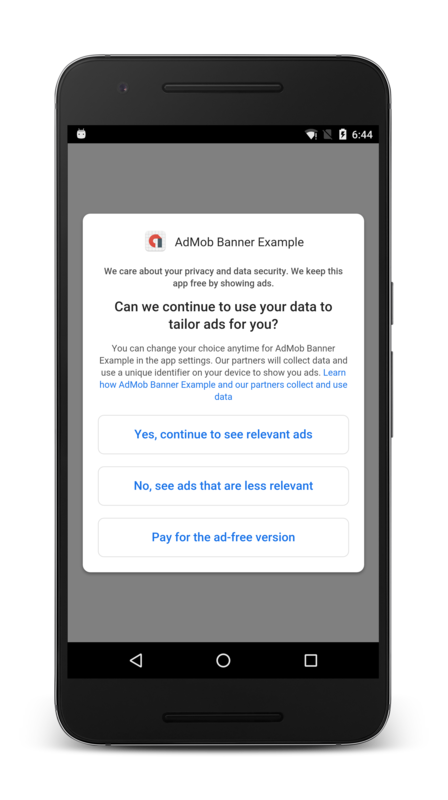 The other option is to use the Consent SDK to dynamically retrieve the full list of ad technology providers from AdMob, as explained in publisher-managed consent collection. However, in this case you'll need to determine how the list of providers should be made available to your users and present your own consent form to your users. You can use the Consent SDK to dynamically retrieve the full list of ad technology providers from AdMob, as explained in publisher-managed consent collection. You'll need to determine which additional ad technology providers from other ad networks need to be presented to your users for consent. Warning: We recommend against using the Consent SDK to store publisher-managed consent if you collect consent for additional ad technology providers beyond those returned by the Consent SDK. The Consent SDK only tracks changes to the list of ad technology providers from AdMob, and cannot track changes to any additional providers you may add to your consent form. When using the Consent SDK, it is recommended that you determine the status of a user's consent at every app launch. To do this, call requestConsentInfoUpdate() on an instance of ConsentInformation. An array of publisher IDs that your app requests ads from. Find your publisher ID. ConsentStatus.PERSONALIZED The user has granted consent for personalized ads. ConsentStatus.NON_PERSONALIZED The user has granted consent for non-personalized ads. ConsentStatus.UNKNOWN The user has neither granted nor declined consent for personalized or non-personalized ads. Once consent information is successfully updated, you can also check ConsentInformation.getInstance(context).isRequestLocationInEeaOrUnknown() to see if the user is located in the European Economic Area or the request location is unknown. If the isRequestLocationInEeaOrUnknown() method returns false, the user is not located in the European Economic Area and consent is not required under the EU User Consent Policy. You can make ad requests to the Google Mobile Ads SDK. If the returned ConsentStatus is PERSONALIZED or NON_PERSONALIZED, the user has already provided consent. You can now forward consent to the Google Mobile Ads SDK. If the returned ConsentStatus is UNKNOWN, see the Collect consent section below, which describes the use of utility methods to collect consent. Registers a listener for the ConsentForm. Each of the overridable methods in ConsentFormListener corresponds to an event in the lifecycle of the consent form. onConsentFormLoaded The consent form successfully loaded. onConsentFormError The consent form failed to load. The errorDescription parameter provides a description of the error. onConsentFormOpened The consent form was opened. consentStatus is a ConsentStatus value that describes the updated consent status of the user. userPrefersAdFree has a value of true when the user chose to use a paid version of the app instead of viewing ads. Indicates that the consent form should show a personalized ad option. Indicates that the consent form should show a non-personalized ad option. Indicates that the consent form should show an ad-free app option. After the user selects an option and closes the form, the Consent SDK saves the user's choice and fires the onConsentFormClosed event. You can listen for this event and forward consent to the Google Mobile Ads SDK. If you choose to collect consent yourself, you can use the getAdProviders() method of the ConsentInformation class to get the ad technology providers associated with the publisher IDs used in your app. Note that consent is required for the full list of ad technology providers configured for your publisher IDs. Note: Before you can call getAdProviders(), you must wait for the onConsentInfoUpdate() method of the ConsentInfoUpdateListener as described in the Update consent status section. You can then use the list of ad technology providers to obtain consent yourself. Upon getting consent, record the ConsentStatus corresponding to the user's response using the setConsentStatus() method of the ConsentInformation class. If a publisher is aware that the user is under the age of consent, all ad requests must set TFUA (Tag For Users under the Age of Consent in Europe). To include this tag on all ad requests made from your app, call setTagForUnderAgeOfConsent(true). This setting takes effect for all future ad requests. To remove TFUA from ad requests, call setTagForUnderAgeOfConsent(false). The Consent SDK has different behaviors depending on the value of ConsentInformation.getInstance(context).isRequestLocationInEeaOrUnknown(). For example, the consent form fails to load if the user is not located in the EEA. Note: Emulators are automatically added as debug devices and don't need to be whitelisted. Finally, call setDebugGeography to set your preferred geography for testing purposes. Does the list of ad technology providers returned by the SDK automatically update if I change my selection in the AdMob UI? Yes, if you make changes to the list of ad technology providers in the AdMob UI, the changes will propagate to Google's ad servers in approximately one hour.